Having failed to set the world on fire, BlackBerry's flagship Z10 smartphone is now being touted at knockdown prices. 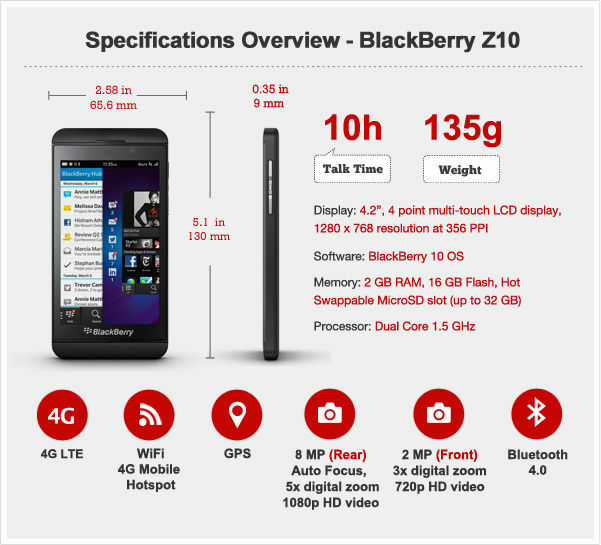 The touchscreen-driven Z10 was BlackBerry's comeback device when it was launched at the end of January. But it was priced alongside top-end devices from Apple and Samsung with premium tariffs - more than £30 per month in the UK. BlackBerry only managed to ship 2,900,000 devices into the distribution channel - and the true number of sales to punters isn't yet clear. But price cuts suggest an attempt to shift inventory. Carphone Warehouse now offers the BlackBerry OS 10 Z10 with no upfront cost from £20 a month (450 minutes, 500MB monthly download allowance on T-Mobile) or £22 (600 minutes, 750MB on O2). New and unused Z10s can be found for around £260 on eBay or £289.99 on Amazon - a long way off the £736 "list price". Other retailers still list the Z10 at around the £500 price. At this sort of price the Z10 certainly becomes a lot more attractive, particularly since it's a 4G handset. It does the basics: calls, web browsing, email and calendar stuff very well and is really a respectable midrange smartphone with something of an identity crisis. BlackBerry thus finds itself in a similar position to Nokia two years ago, asking for premium prices for its similarly respectable first generation of Lumias, also midrange phones with a premium price tag. Both companies found that brand reputation isn't really enough for savvy and hard-headed customers faced with two well entrenched market leaders. Are you tempted to get one? The phone experience has changed so much since our initial review, it deserves a reappraisal - but you need to bear in mind two strong caveats. The first is that the choice of third-party applications for BlackBerry OS 10, which powers the Z10, is the weakest of all smartphone platforms. This can be ameliorated by side-loading Android apps, but this is a stop gap and these don't really have the performance or reliability of applications running natively. Secondly, as a Z10 user you become something of a guinea pig: BlackBerry OS10 is a new platform which is really still in "late beta". BlackBerry loyalists have had to be patient as the company flung out regular updates to the new QNX-based operating system with fairly mixed results. Some updates gave the phone huge battery improvements, others took them away. Much can be done to make the experience of using the aggregated messaging system ("the Hub") match the promise.